Board fencing is attractive, functional and easy to install. The most common type of board is rough sawn oak, 1" x 6". Boards are commonly available in 16-foot lengths and attached to post that are spaced 8 feet apart. When selecting material, watch out for warped, loose knots and checking. 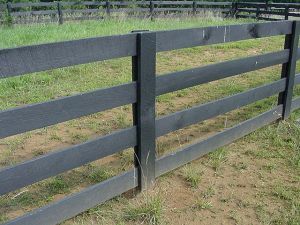 Other articles discuss the types of fencing, installing fence posts and wire fencing. Keep your nail gun in good condition and check the safety switch. Place fence board on scrap block or post for sawing.